The book says its which side of the door you are on, is it the entrance or the exit. It's still the same door, its just a matter of from what direction are you looking at it. When you are outside its the entrance, when you are inside and looking at it, its an exit. Now, we could get all existential and say things like "Well, yeah, but if you are outside and looking at it, it could be an *exit* from the outdoors as well as an entrance." Sure, we could say that. But we won't. Because this isn't a philosophy class, we're learning about WiFi. So anyway, if you are at the Physical Layer, its a PSDU. If you are on the MAC Layer its a MPDU. Just to recap in case you have forgotten what all of the acronyms mean, like I did by this point. 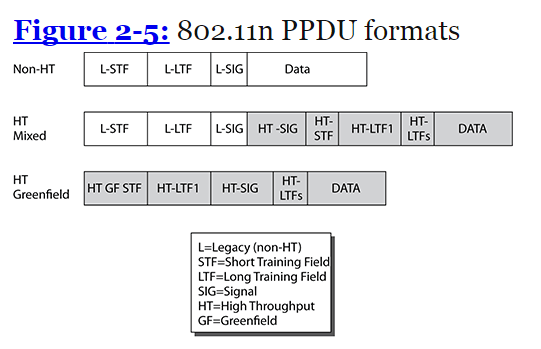 PSDU - PLCP Service Data Unit - Yo dawg, I heard you liked Acronyms, so I put an acronym in your acronym. Alright, so lets try and follow the path again. If coming from the upper layers down to the Physical Layer - L3-7 info comes down to L2 which is split into two layers. The first one that it hits is the LLC, here the L3-7 data is in the form of an MSDU. That MSDU is then passed down to the next sub-layer of L2, the MAC sublayer. Here the MSDU is encapsulated into an MPDU. The MPDU is then passed down to the Physical layer. Which, like L2 is split into two sub-layers. The first one that it hits is the PLCP. Now that its here, its considered a PSDU. Remember going from L2 to L1 means that somewhere along the lines the MPDU went off to college and changed its name to PSDU because it thought that sounded edgier. Now that it has had its name legally changed, it gets a PHY header and a preamble added to it. Thus creating a PPDU or PLCP Policy Data Unit. The PPDU is then passed from the PLCP sub-layer down to the PMD sublayer, where its actually modulated as bits. Great! We just transmitted data wirelessly. Well, at least thats the progression of the protocol. Now lets take a bit of a deeper look at the PPDU, which remember is the PLCP Policy Data Unit. 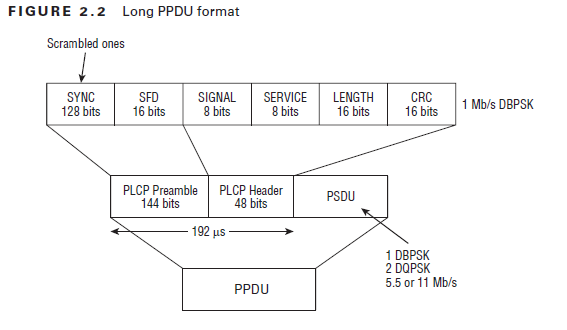 The components of the PPDU are the recently rebranded PSDU that was handed down from the MAC Layer (remember it was the MPDU at the MAC layer) the PLCP Header, and lastly, although it comes first in the transmission, the PLCP Preamble. A preamble? Like -- We the bits of this wireless frame? Well, in a way, yes. A preamble by definition is a preliminary or preparatory statement such as an introduction. Here, the transmitting station will send out a series of bits (1's and 0's) to give the receiving STA a heads up that the frame is incoming and how to synchronize to it. The book lists six different preambles. Three that were defined in the 802.11-2007 standard and another three that were defined in the 802.11n standard. If there were any additional that were introduced in 802.11ac they aren't in this book. But if I come across them I'll edit this. 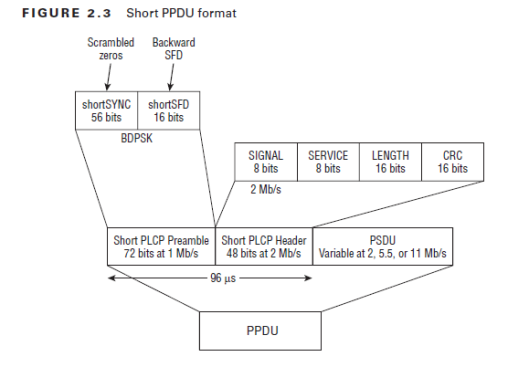 This is a 144-bit PLCP Preamble, with 128-bits of that coming in the form of a sync field, and the remaining 16-bits are a "Start of Frame Delimiter" (SFD) A receiving STA will start to synchronize with the incoming signal when it detects the sync field. But now that the synchronization has started, how will the receiving STA know when the actual data has started? Because it detects the SFD. As soon as the receiving STA hears the SFD, it knows that the PCLP Header is incoming. Its important to note that the receiving STA doesn't need to hear the entire Sync field, as long as it identifies the SFD. The Long Preamble is transmitted using DBPSK (Differential Binary Phase Shift Keying) at 1Mbps, as is the PLCP Header. However the modulation method of the PSDU is not necessarily the same as the preamble or the header. It can be transmitted at 1, 2, 5.5, or 11 Mbps. The whole transmission of the preamble and header takes 192µs. The Short PLCP Preamble is... shorter! In fact, its half the size at 72-bits versus the 144-bits of the Long Preamble. Those 72-bits are made up of a 56-bit Sync field and a 16-bit SFD. Note that the SFD is the same length with both Preambles. Their content is actually just reversed. The short Preamble is transmitted using the same DBPSK as the Long, transmitting at 1Mbps. However the Header is transmitted at 2Mbps using DQPSK (Differential Quadrature Phase Shift Keying) Just as with the Long preamble, the Short Preamble and Header both have fixed modulation, but the PSDU can differ. This is often referred to as the OFDM training structure - It uses 10 short symbols, and 2 long symbols with a guard interval separating them. Following the second long training symbol are Signal and the Data Fields. However between the training symbols and individual subsequent fields, are Guard Intervals. Following the Long and Short PLCP Preambles, comes the PLCP Header. It's 48 bits long and contains four fields. Service (8 bits) - 5 out of 8 bits of this are actually used. Each bit thats used determines a different thing. - Bits 5-7 are used to resolve data length field oddities if PBCC is actually used for whatever reason. But wait! There's more... with the ratification of the 802.11n amendment came two new PPDU's, and the sort-of reuse of an older one to allow for legacy devices to coexist with newer HT devices. Below are their explanations, and below that is a figure showing all three. This format was developed is for the standard to essentially mimic and provide backwards compatibility to legacy STA's. And is essentially the OFDM Preamble with 10 short symbols and 2 long symbols. The beginning part of the HT-Mixed Preamble is the exact same as the Non-HT, with the 10 short and 2 long training symbols. This is so that legacy devices can decode the preamble and essentially understand enough to know that they have to wait to transmit, and that the following data isn't for them. The rest of it can be decoded by HT devices though. This HT portion contains information necessary for MIMO. This is probably the most commonly used format for 802.11n since it supports both legacy and HT type devices. It works on both 20MHz and 40 MHz channels. If a 40MHz channel is being used, then all of the broadcast traffic that might be used by legacy devices needs to be sent on a legacy 20MHz channel. Obviously if a transmission is destined for a Non-HT client then they would be use only the 20MHz channel. This method is *not* compatible with legacy devices. Because of this its support is only optional. Also, you may have noticed that the captions mention the PW0-270 book. Thats because it is. The CWAP-402 book touches on this, but only lightly (in comparison to the PW0-270 book). Nice article, i am reading the book as well. Please fix this "Policy Data Unit", it is "Protocol Data unit"